Instrumentation/ Environment/Metallurgy) vacancies in this GSECL Recruitment Test Notification 2017. Candidates who the qualified B.E/B.Tech in the said disciplines they are eligible to applying for this Vidyut Sahayak JE vacancies. 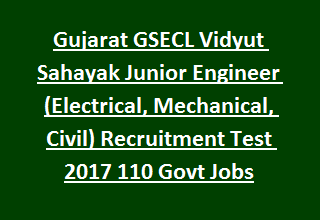 Last date for submission of applications for this GSECL Vidyut Sahayak JE Junior Engineer Jobs is 11-12-2017. Based on applications received candidates will be shortlisted for online test for this GSECL Vidyut sahayak vacancies. Age limits, pay scale, online application procedure and other information is given below for this Gujarat GSECL Vidyut Sahayak Vacancy Recruitment Notification. Download officialnotification of Gujarat GSECL Vidyut Sahayak JE Vacancy. Fee payment last date is 17-12-2017 through chalan. There are total 110 vacancies in Gujarat GSECL Recruitment. Post Name: Vidyut Sahayak -110 Posts. Candidates must have qualified B.E/B.Tech in any one of the Engineering Disciplines of Electrical, Mechanical, Instrumentation and Control, Environment, Metallurgy and Civil. degree from any recognized university. Must have computer knowledge for applying this Vidyut Sahayak Junior Engineer Jobs. As on 06-11-2017 candidates age limits are 18 to 35 years for UR candidates. For SC/ST/ SEBC and UR Women candidates age limits are 18-40 years. Candidates who are interested in this Junior Engineer vacancies of GSECL with necessary qualification they can submit online from 06-11-2017 to 11-12-2017 through GSECL careers website of www.gsecl.in. Download Notification for Gujarat GSECL Vidyut Sahayak Recruitment Walk in Interview Notification 2017.